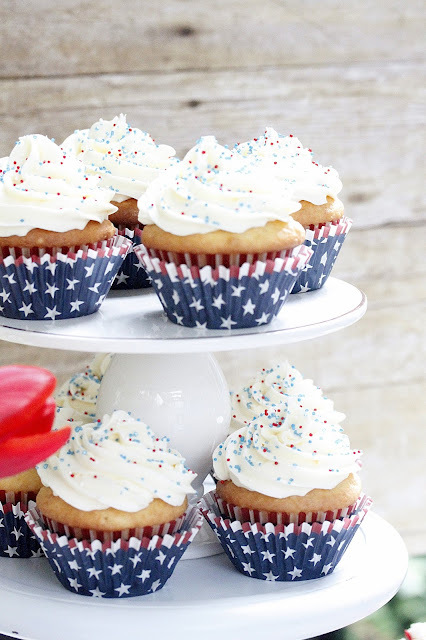 A Fourth of July Celebration! Summer's here, and that means the beginning of all those fun and festive outdoor parties and BBQ's. 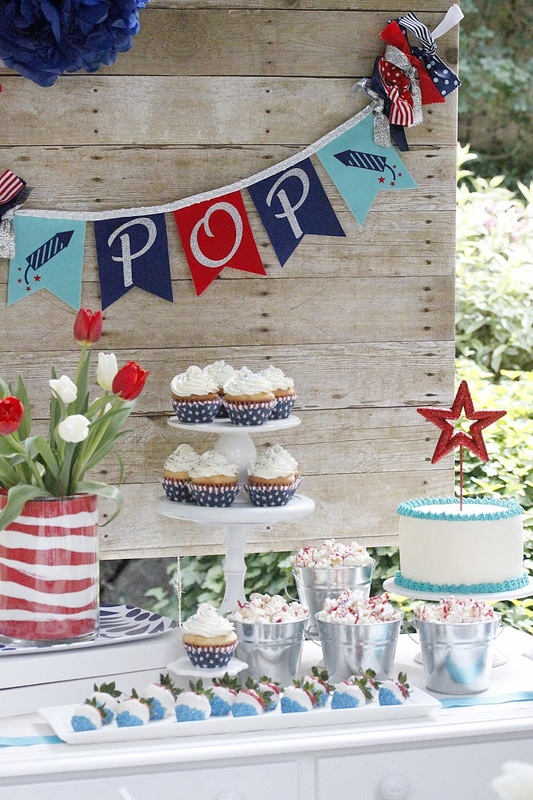 One of my favorite holidays would have to be the Fourth of July! Can you believe it's less than a month away? 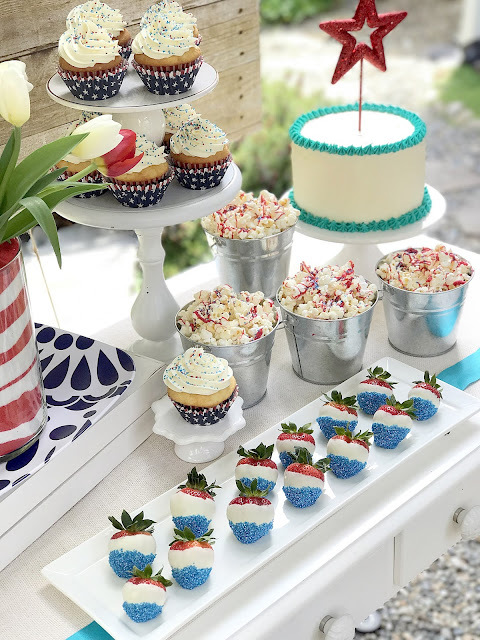 My Sweet Liberty Celebration is full of ideas and inspiration for your upcoming 4th of July parties and summer soirees..... so......Let the inspiration begin!! 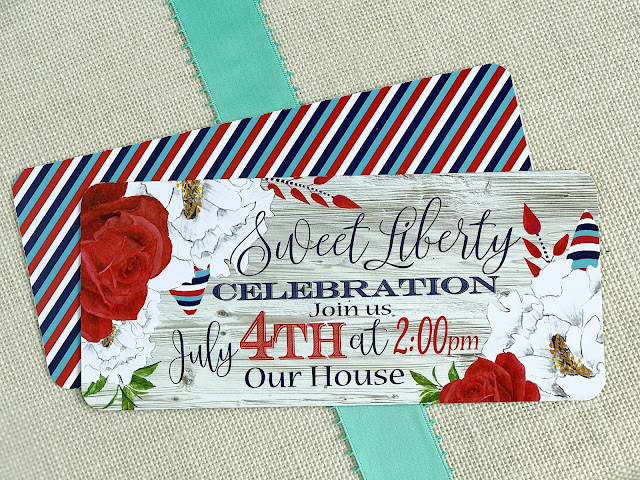 Like always I started by designing the invitation and other printables as this sets the tone for the rest of the party. 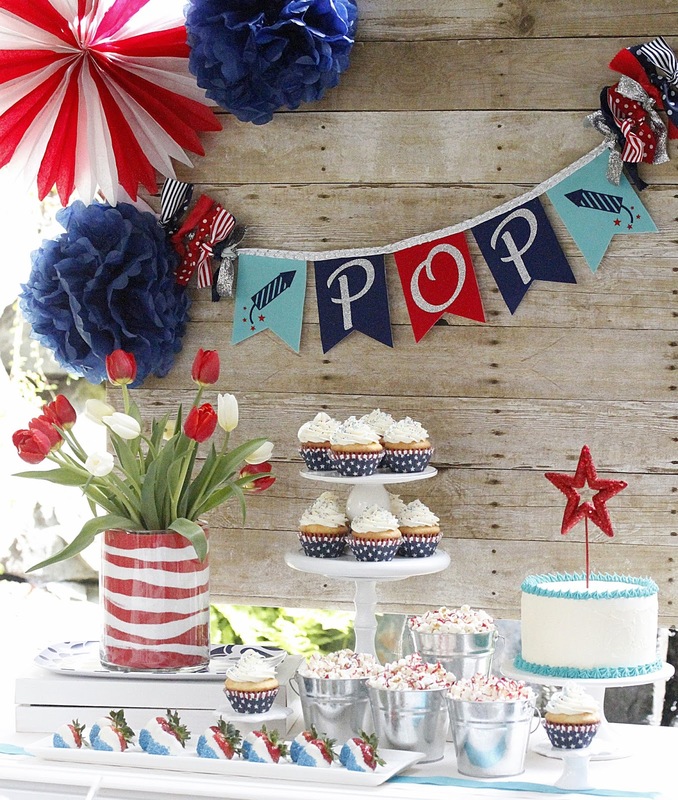 I decided to give this party a rustic flair by adding in the wood plank element. 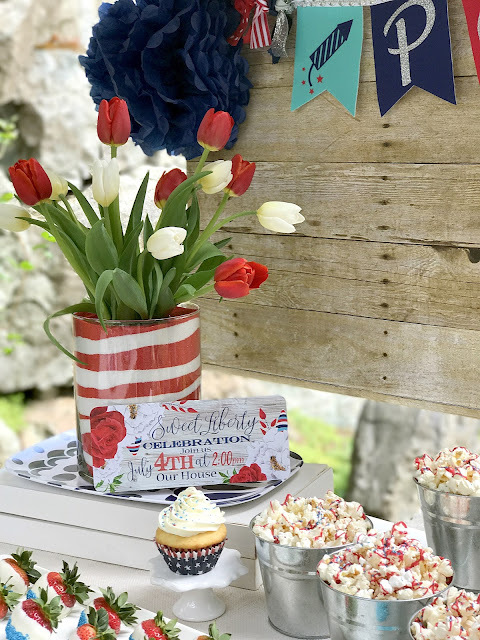 I definitely wanted to use the classic red, white and blue but for some added fun added in a POP of turquoise and silver SPARKLE and the flower element for a touch of elegance. Find this design and many more at my ETSY shoppe here. 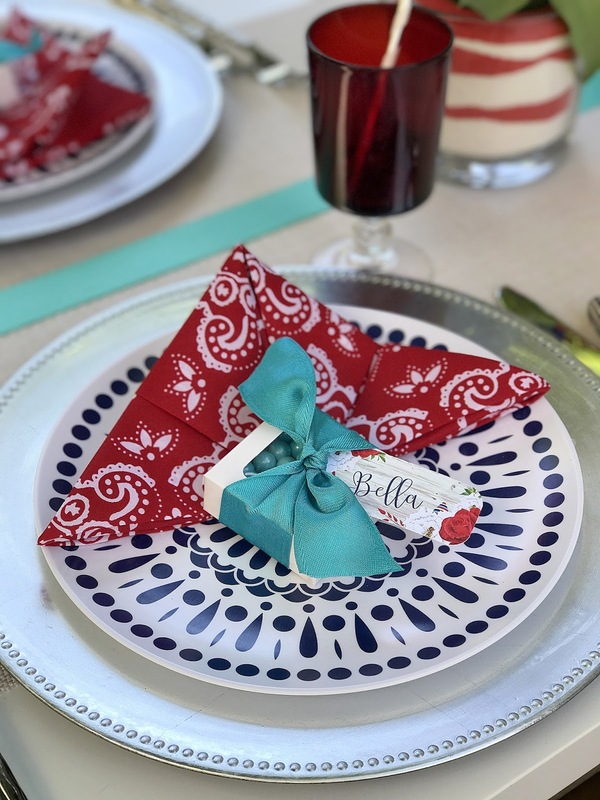 The tablescape was created by first laying down a white burlap table runner and by simply adding a piece of turquoise ribbon down the center you instantly add color and interest to your table. 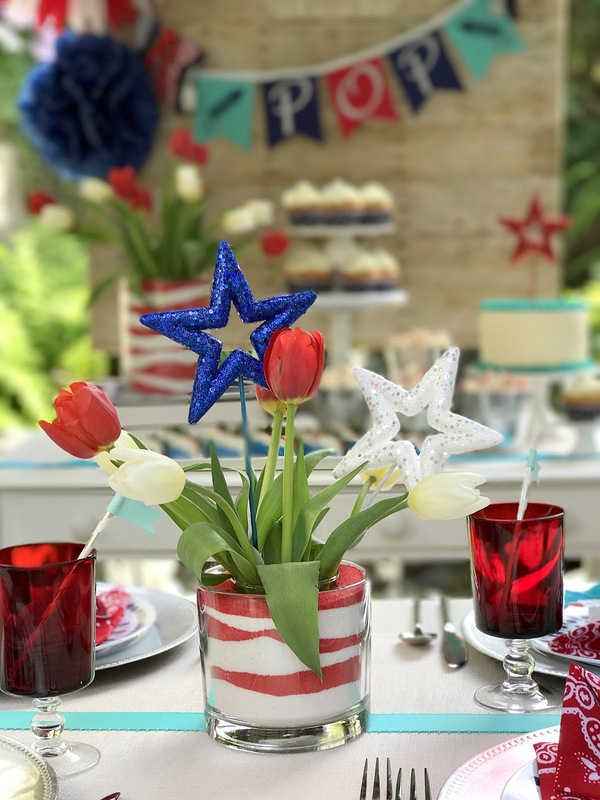 The centerpiece was a gorgeous DIY sand art vase filled with some lovely red and white tulips and a couple sequinned stars for some added pizzazz! The sand art vase was easily created by placing a slightly smaller vase inside of your chosen vase and using a small funnel, simply pour red and white sand around the vase, alternating colors until its full to the top. 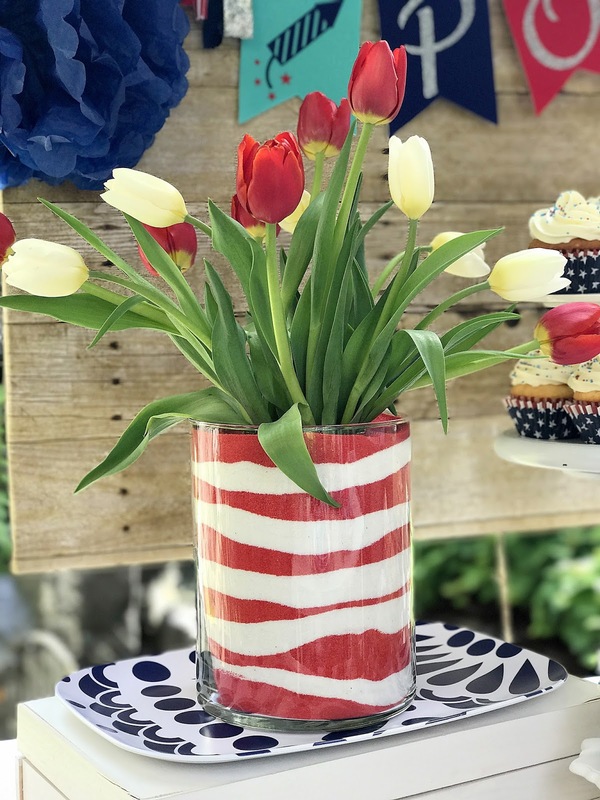 Then just add water to the middle vase and flowers of your choice. Its that simple! But what a stunning centerpiece it creates! For the place settings I used beautiful silver chargers topped with the loveliest Melamine dinner plates designed by Gail at the Plateshoppe. 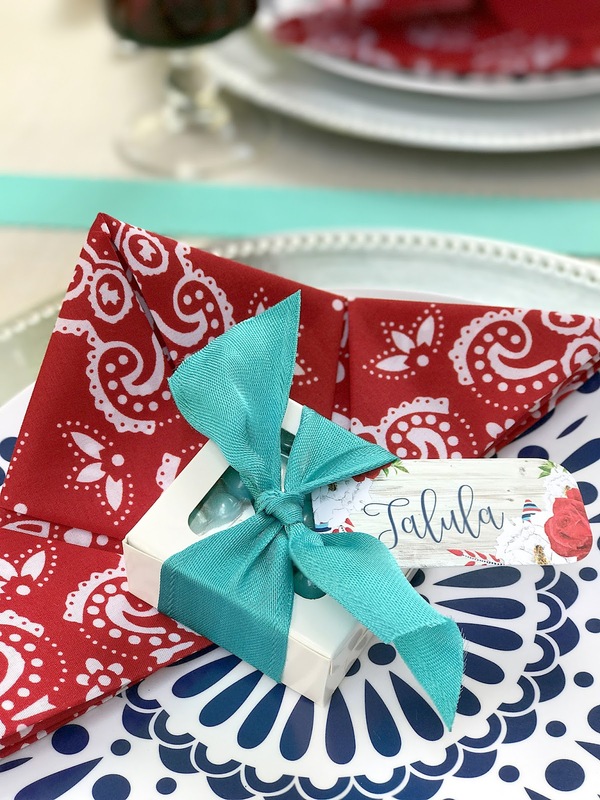 I didn't want to cover the beautiful pattern with a napkin so I strategically folded a red and white bandana...yes, a bandana into a triangular shape and placed it on the plate with a darling favor box filled with turquoise chocolates which also doubled as a place card for each guest. 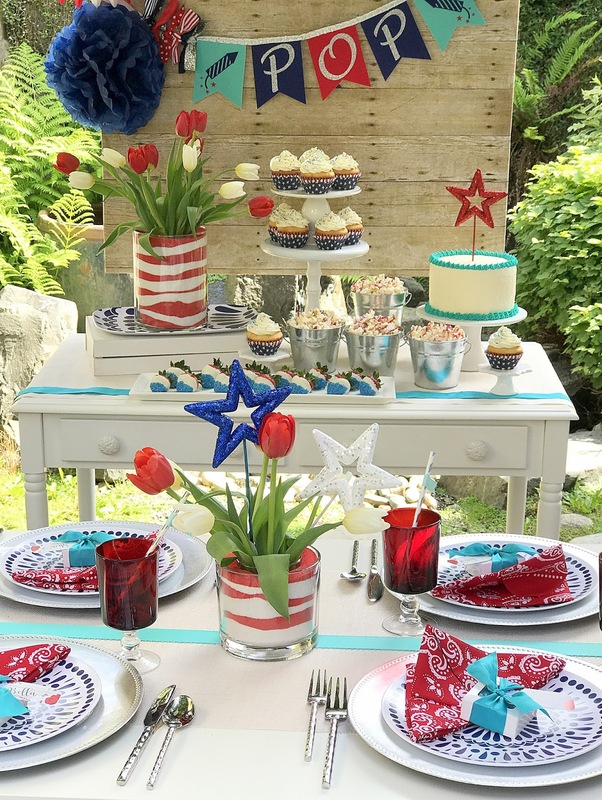 Antique red glasses were placed to the left and that completed the rustically elegant tablescape. 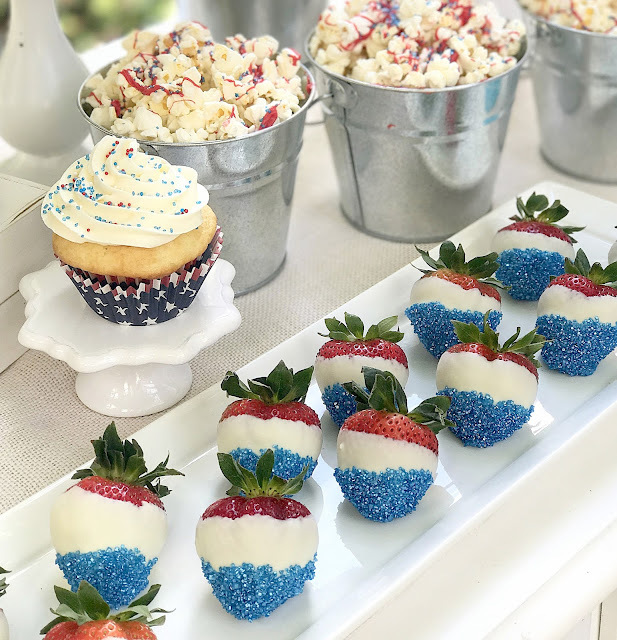 The backdrop for this patriotic inspired dessert table is definitely up there when it comes to favorites and you won't believe how easily it can be recreated! 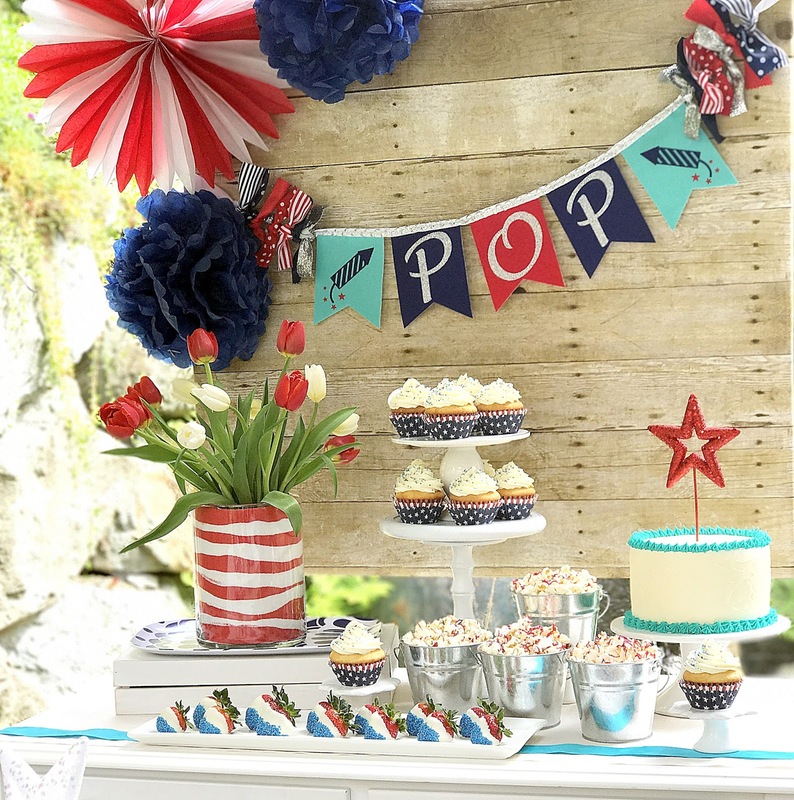 The wood plank backdrop was created by using the most fabulously realistic paper roll I came across at Oriental Trading. I couldn't believe how real it looked when I opened it. I just simply wrapped it around a 40" x 40" blank canvas. You could also use a piece of foam board as well. 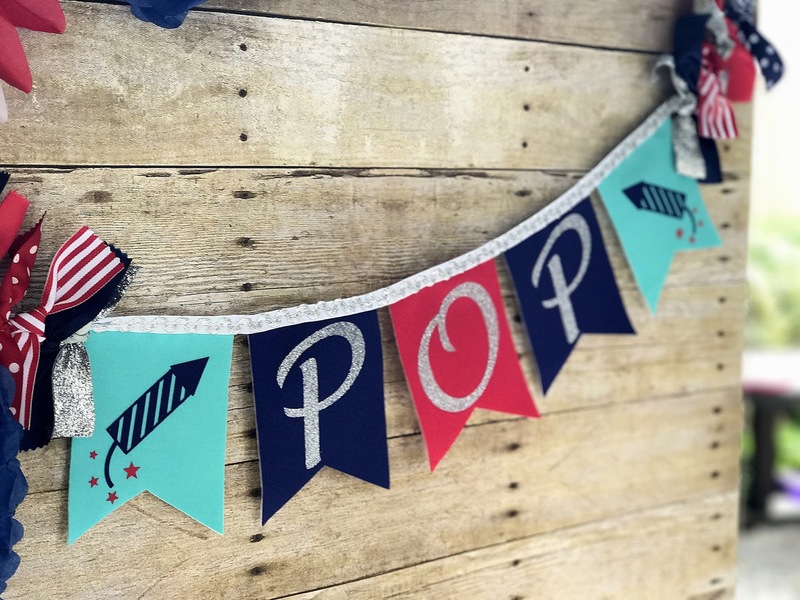 My favorite piece though would have to be the "POP" fabric banner created by Bethany over at Sweet Georgia Sweet. She makes the most darling fabric banners and party centerpieces and can customize them to match your celebration perfectly! I added a couple navy tissue poms and one red and white striped tissue fan decoration and the backdrop was complete! 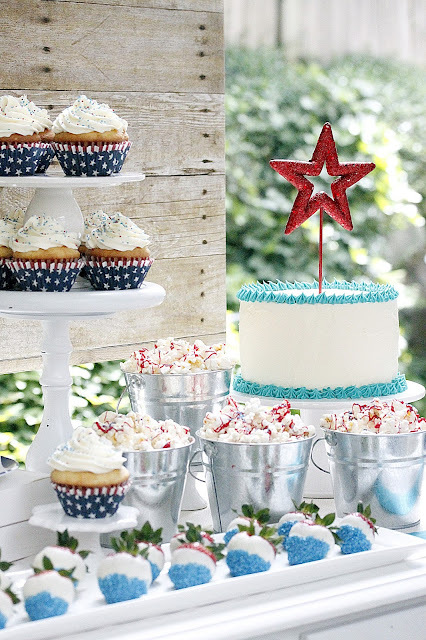 The dessert table is always my favorite part of party styling. Probably because I have such a huge sweet tooth! 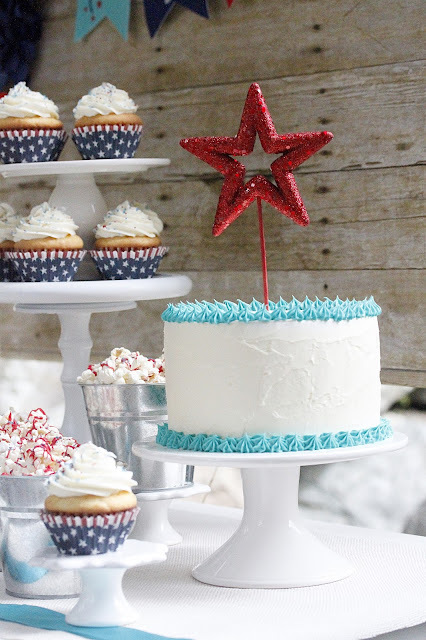 I like to place my desserts at different levels for added interest. I also like to use a variety of cake stands, platters and containers of different colors and textures for more added interest. 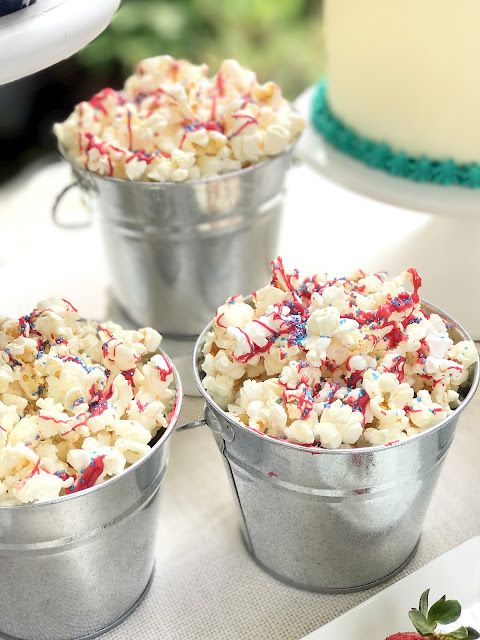 This dessert table had some classic vanilla cupcakes, patriotically seasoned popcorn, white chocolate covered strawberries finished with blue sanding sugar and a classic white cake decorated simply with some turquoise frosting piped around the edge and finished with a red sequinned star cake pick. 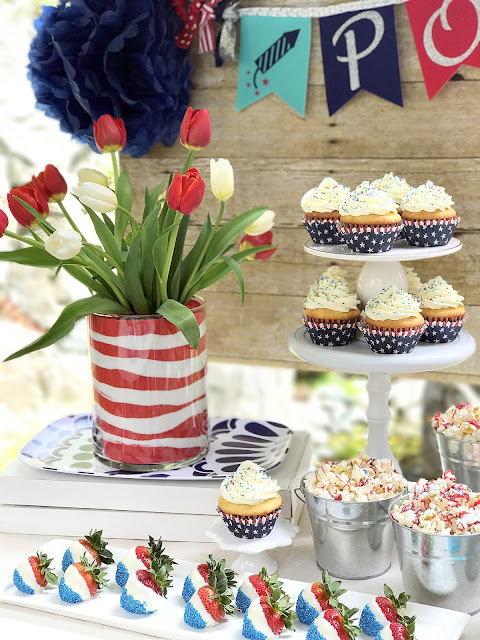 I hope you found lots of inspiration to use for your upcoming Fourth of July celebrations or perhaps some to use for those summertime BBQ's and cookouts! 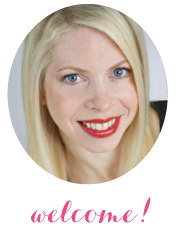 Enjoy some more inspiration below and thanks so much for stopping by! This is gorgeous! 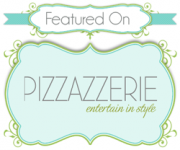 You are so talented! Hello! 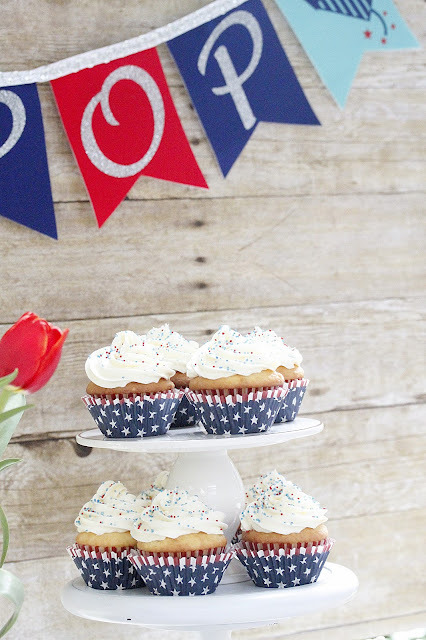 I'm Misha...a wife, mama of 4, Interior Designer and Party Stylist. 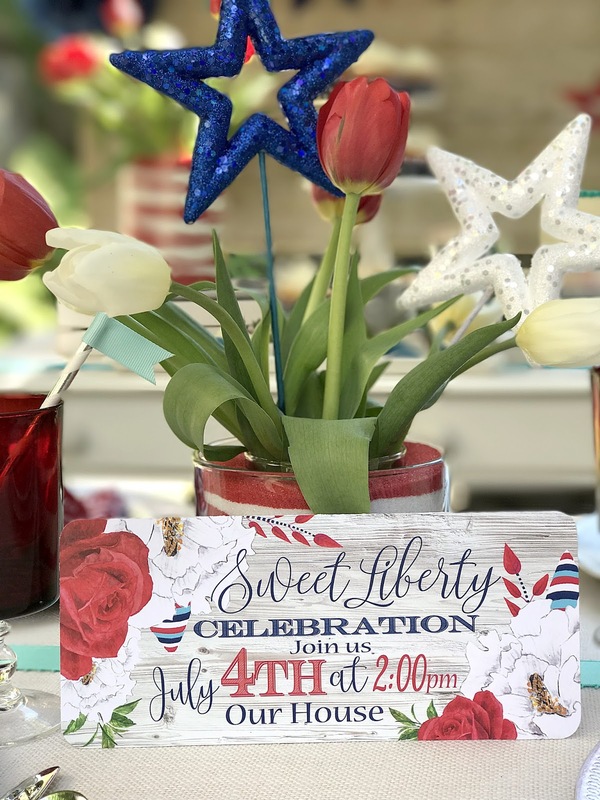 Join me as I create, celebrate and decorate a lovely design!.